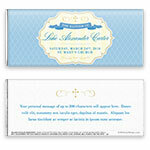 With a touch of royal elegance, this beautiful chocolate bar wrapper is suited to any special celebration. Design: Diamond pattern with gilded frame and ribbon banner. 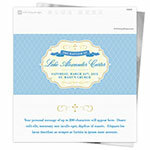 Personalization: Front name, event and date with back message.